Curently this online tutorial is more like guidelines than "set-in-stone" instructions. Read them over, get a general sense of how things are put together, then go with your natural instincts as you assemble the Tusken head. Some people use hotglue, others prefer to use epoxy, some people use Monks cloth for robes, other use woven blankets found at department stores. tTere is no one-way to make a tusken, lots of wiggle room for variations on the theme. All in all, just have fun building the costume, that's what it is all about! First thing I did was sculpt out a base head from which I would make the Tusken Raider mask from. 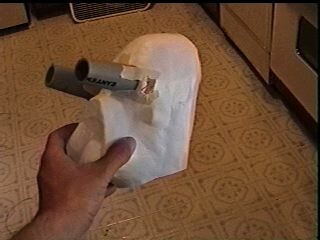 I would pull a plaster cast of this and then make a plaster positive plug mold to vacuumform a head from that. 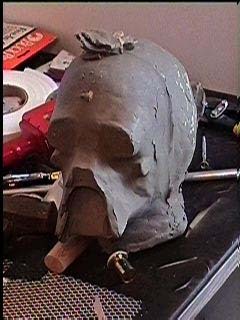 You might not be able to create a vacuumformed base from which to build your own tusken head from... but Paper machie will work well to. I suggest painting the final paper machie to ensure a strong base from which to attach Tusken detail pieces to. Some very clever artisans rigged up two lazer pointers and figured out how to keep the lasers equal distance from each other and therefore take measurements of the Props at the "Magic of the Myth" Exhibit. 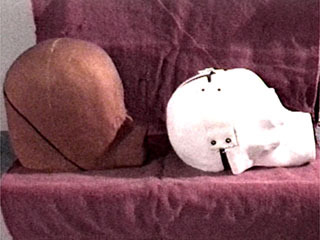 The pictures below shows a "head form" that the artists created from these measurements (This is the 'Godzilla' latex mask). Next to their latex head is the vacuumformed base mask that I made. I got very close to the face dimensions of the head, but the over all crown size I was off by about 15%. Update: I have finally remastered my base head to be more accurate to the 1977 head size. Click on this image to see a measurement diagram of the head I created for my original tusken raider mask. This gives measurements for the mask, the eyes, the teeth and the tusks. Keep in mind the measurements are for my handmade head, not the movie accurate head. 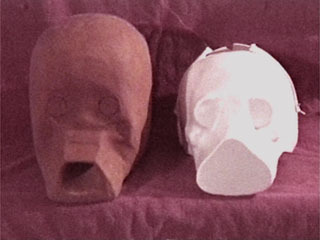 FOR SALE : I am offering pre-formed face masks to the fans, for the making of their own tusken raider costumes. Contact Us if you are interested. I offer a 1977 "A New Hope" accurately sized faceplate with a backplate. I hand-make these faceplates year around for the fans. Shipping cost is included in these prices. 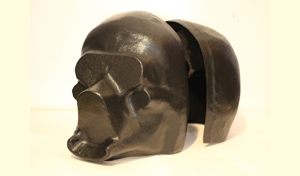 ALSO FOR SALE : The Godzilla Tusken Head kit is available once again. Made as a kit (or sometimes a finished piece) it is accurate in size, materials, colors, and construction including a carefully sculpted base mask, cloth bandages and machined aluminum parts. Email Godzilla himself to get pricing and information. Tell him Studio Creations sent you. 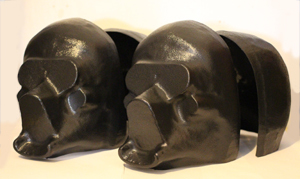 Here is the base plastic mask with prototype eyes pieces taped onto it. To make the eyes I wanted to get a machinist to lathe me out some eyes from aluminum rods... this proved too expensive so I had to come up with an alternate method of making the eyes. I finally came up with the idea to take a plastic water pipe , heat it up and shove it over a tapering wooden couch leg. 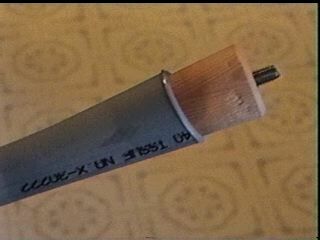 Here is the plastic pipe shoved onto the wooden leg. 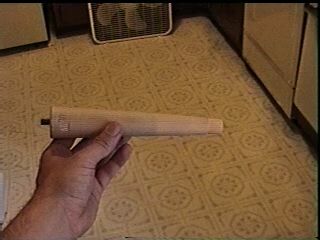 I heated the plastic pipe over an electric stove and kept rotating the pipe so that it would not burn in one place. Uniform surface heating of the pipe is crucial, hold the pipe still for to long and one side will burn while the rest of the pipe is still warming up. Are there cancer risks with melting PVC pipe? Well, if you burn 20 or 30 of these pipes everyday day for a months, yeah, I would be worried. As for just making 2 or 3 eye stalks for a one-time project, I doubt you have much to worry about. Fumes can be a problem, though. I recommend putting a fan in the window and forcing air to leave your kitchen/work area. Open those windows and get fresh air in as fast as possible. It's better to be safe than sorry. I cut the eyes from the base pipe at about 2.25 inches (5.7 cm). Longer eyes do not work that well. They look "too" alien.